Inspired by madeddie's ESP mission, i dug up this old project and attempted to finish it. 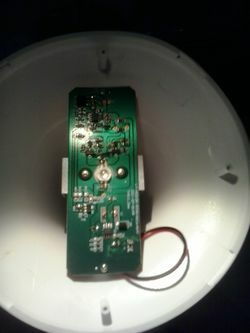 Had it working on breadboard so moved to put it inside the actual lamp. Doing so I seem to have broken ~something. Currently debugging. ir rx    ----| 4         8 |----  ? Funny bit is, the PWM signal is actually inverse. So they output a high signal to turn off the LED, and a low signal to turn on the LED. This can be proven by grounding one of the pwm output pins, which turns on the respective color of LED. 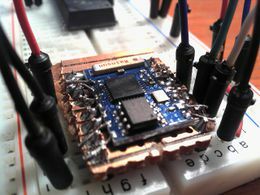 Do fancy fades inside the ESP8266 ?